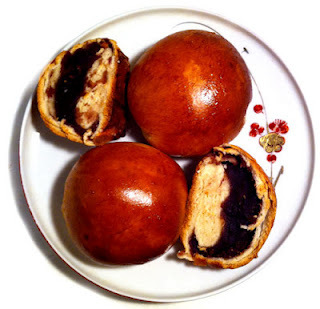 AnPan buns filled with anko (adzuki sweet bean paste) have delighted Japanese children and adults for decades. As Americans are more open than ever to try Japanese treats and ingredients like adzuki red beans, I thought I'd share my AnPan recipe. Enjoy! Pour in the water and slightly whisked ½ egg. Choose the White Bread and Dough Only setting on your bread machine. Divide the dough into palm-sized/baseball-like balls. Roll out to approximately ¼ of inch thick circles. Fill each circle with red bean paste. (Not too much or it will ooze out.) Wrap into a tight bundle. Brush each with whisked eggs. Bake for 35 minutes or until golden brown. Enjoy!